Which wetsuit (buy or hire)? As we head into the 2019 triathlon events season, it’s time to start thinking about heading into the open water, and that means getting a wetsuit. Whether you’re a novice or a seasoned pro, it’s worth weighing up the options with regards to hiring or buying. 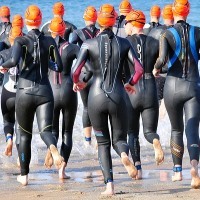 If you’re totally committed and swim regularly in open water then buying a wetsuit will probably be more cost effective for you, however if your open water swimming is restricted to events only, then you may find that hiring, either as a one off for each event or for the whole season, is a better budget friendly option for you. We’ve had a fresh look at the market for you, and have these suggestions. (Please note that thetrilife.com does not represent or endorse any of these brands or companies, and our findings are based on our own research only). 2XU offer triathlon wetsuit season hire for £85 for the entire open water season, plus a £50 refundable deposit. The wetsuit needs to be returned by 30th September 2019, otherwise you will lose the right to your refund and you will need to clean and dry the wetsuit out before returning it. You can also opt for day hire (£30) or month hire (£55). If you decide to purchase the wetsuit after the hire period, the hire cost will be deducted from your purchase. Mywetsuithire (Reading based) offer over 50 different wetsuits from the most trusted brands and have rates of 2 week hire from £29.95 and full season hire from £59.95, plus a standard delivery charge of £10. They offer a “quick hire” service if you’re not sure what wetsuit to go for. You can give them your height, weight and the event you’re taking part in and they’ll choose the best wetsuit for you. TriUk have a very transparent hiring option available – hire fee for each (brand new) wetsuit is £40.00 and the suit should be returned by 1st October 2019. Postage & packing for each wetsuit is £9.99. Upon hire a refundable deposit is payable of £50.00 (The suit must be returned to TRI UK in the same condition it was sent out in or charges will be incurred. Each returned suit is individually inspected and the following charges are made where applicable: £10 for cleaning, and £10 for each hole/rip/tear/undue damage, and £10 if the suit is wet. So your total cost for season hire for a wetsuit is £99.99 (with £50 returnable). Should you decide that you want to keep the wetsuit, the Hire Fee (£40), Deposit (£50) and Postage (£9.99) cover the full value of the Wetsuit (£99.99) so you just let them know, they keep your deposit and you keep the suit. All hire suits are brand new and sealed in their packaging from point of manufacture and are therefore in perfect condition. Both the men’s and the women’s wetsuits have 4* reviews and lots of positive comments. Lomo have some really competitively priced wetsuits, with prices starting at £50 for 3mm neoprene and £65 for 5mm neoprene, in both men’s and ladies. The reviews that they have on the site are pretty positive, so one to look at if budget is key. They also have children’s wetsuits from £25.00 if you’re looking for something for your junior triathlete. Perhaps you’ve completed your first season in a hired wetsuit, know that you’re committed to the sport and are now ready to spend that little bit more to get a higher spec wetsuit with the comfort and fit that you know you need. Huub is a name you’ll hear time and again when talking wetsuits – they have won the 220 Triathlon Best Tri Wetsuit Brand of the Year every year since 2013, which is a highly convincing accolade. They state “our range includes tri wetsuits for men and women, with neoprene flexibility, thickness and stretch that’s unmatched within the industry” and they have great reviews across tehir various designs and styles. Prices start at £199.99 for men’s and women’s and £139.99 for a junior triathlon wetsuit. Zone3 are another well know brand name, and is Europe’s leading triathlon and swimwear brand. They are also an award winning brand and received the first ever 10/10 review from 220 Triathlon Magazine. Prices start at around £169 (there are cheaper entry level options in the sleeveless range) for adults and £129 for kid’s. If you’re a big believer in “you get what you pay for” and what to invest some serious budget into getting the best wetsuit available, then there’s certainly some great options out there available to you, including both of the mid range suggested brands, who also have some great top level offerings. A company that are totally focused on swim gear, BlueSeventy have the sixth incarnation of the HELIX, what they dub as their finest suit ever. Built using all-new LIFT technology, this suit puts every swimmer in an efficient downhill swimming position. Tested and refined by Olympic & World Champion athletes, it features premium materials, a propriety shoulder design, and many other speed-enhancing features. A true second skin and lightning fast through T1. Prices come in at around £575. Orca offer wetsuits to suit every swim style and budget so that every athlete’s individual needs can be met. They say that they are “by triathletes, for triathletes” and they help you to ascertain what type of swimmer you are and then direct you to the best wetsuit for you, whether you are a natural swimmer, a total swimmer or a progressive swimmer. Their top end wetsuit ranges come in between £549 and £649 but they do also have some mid range offerings.